Finally. FINALLY. Today is THE day, Gladiators. The wait for Scandal will officially be over at 10:00 p.m. tonight. I can hardly wait to see what Shonda’s got for us. I know it’s gonna be awesome, but I just hope my blood pressure can handle it. Scandal has a tendency to return with a real ‘bang’ that leaves me reeling. Hopefully you’ve been following along with me in our countdown to today’s season return, but if you haven’t that’s okay. I’ll post links to all the other recipes in the Scandal series at the end of this post in case you want to check them out (which I highly recommend that you do). 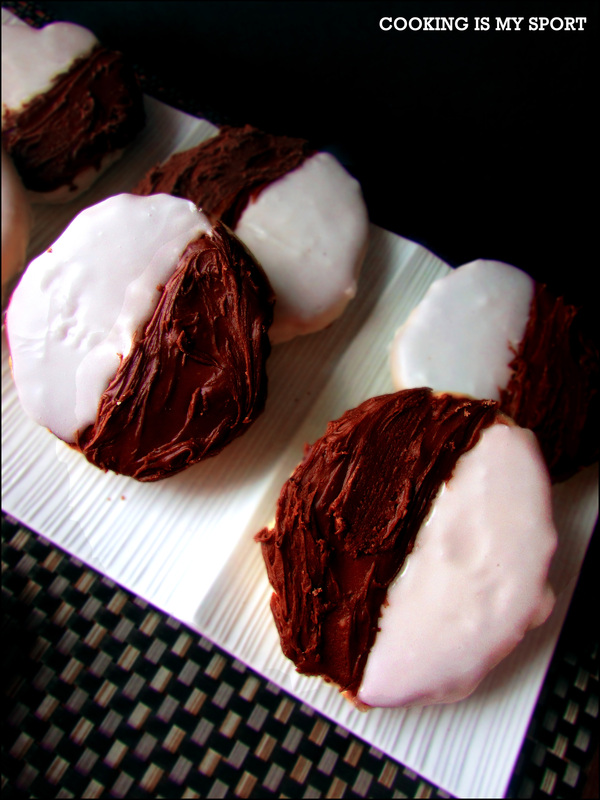 I’ve wanted to make Black and White cookies for a long, LONG time. I’ve mentioned in the past that my favorite dessert is a thick, bakery-style sugar cookie. 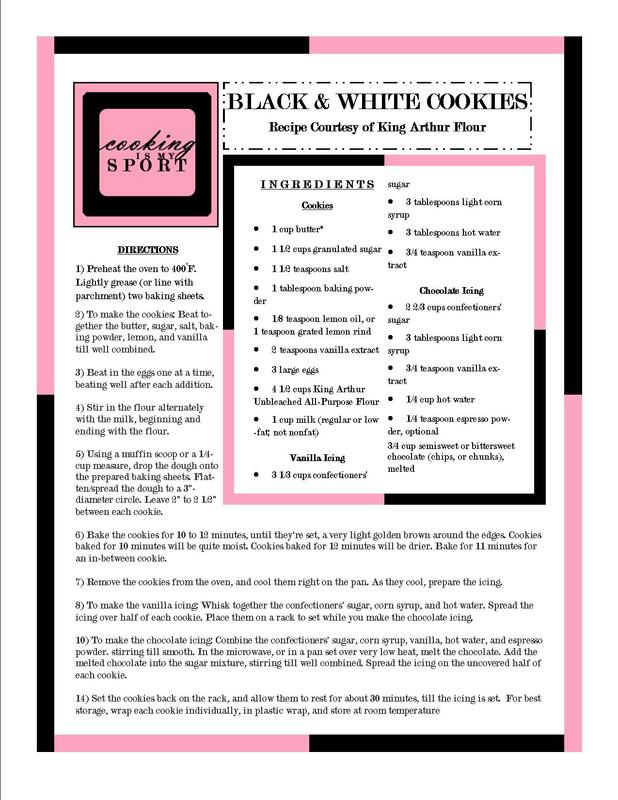 Anytime I find a recipe that’s even remotely similar to it, I’m gonna want to try it just out of curiosity to see if it will satisfy my craving and meet my ‘Sugar Cookie’ standards- that are actually pretty steep to be honest. I’m an absolute sucker for these kinds of treats, guys. After that first bite, literally the first thing that came out of my mouth was “Wow!” It was everything I want and love in a cookie: the dough had a pleasant lemony flavor all on it’s own, the texture wasn’t too dry and crumbly, and the icing (on both sides) provided just the right amount of extra sweetness that sent the taste of these cookies over the top with deliciousness. I didn’t expect to like them as much as I did, and I didn’t expect them to puff up so thick and lovely in the oven the way they did either. Typically I have to chill my cookie dough overnight to get these types of results, but these went straight from the mixing bowl to the sheet pan to the oven- it probably had something to do with that 1 tbsp of baking powder that’s in the recipe, huh? Decorating tip: Use the vanilla icing FIRST, then let it fully set up before spreading on the chocolate. I also held a pastry scraper down the middle of the cookie while spreading the chocolate to make sure it didn’t smear with the white icing, but I could see the flat end of a butcher knife or something like that working in a pinch too. The Scandal inspiration for these cookies isn’t as obvious as you may think. Yes, obviously we have a Black-White relationship on the show, but my reasoning was a little more complicated than that. If there’s anything that 2 1/2 seasons of this show has made clear, it’s that in Shonda Rhimes’ crazy, but brilliant world, nothing- absolutely NOTHING- is ever strictly black or white. Just when you have one impression of a character or situation, the plot spins around to make you switch sides. One week, it seems like it’s Black. Another week, it seems like it’s White. Then other times, it’ll seem like it’s a little bit of both. You just never know in Shondaland. 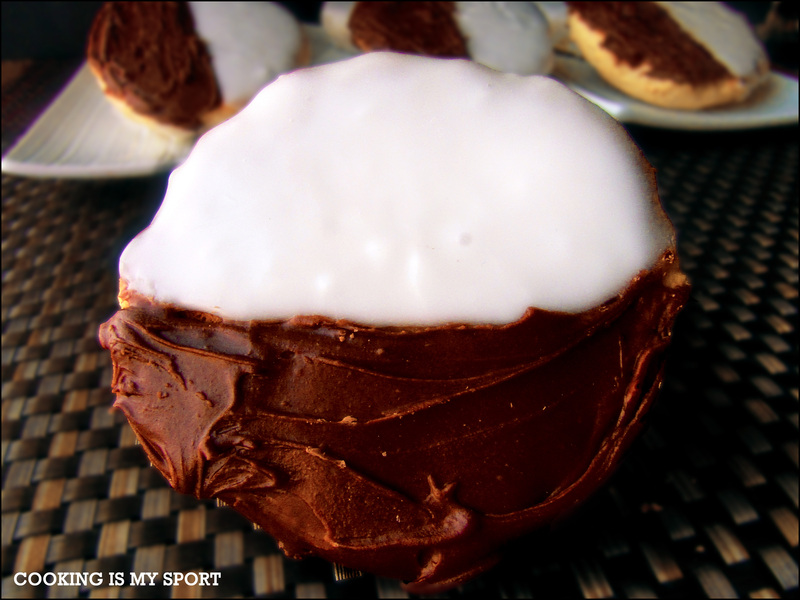 But regardless, we love it all the same..just like with a Black and White Cookie. Well, we did it Gladiators. We made it to Scandal Day. I’ve had a blast with this series, and I hope you take the time out to try one of these ‘Scandal-ous’ Recipes below. You won’t regret that you did. 1) Preheat the oven to 400°F. Lightly grease (or line with parchment) two baking sheets. 2) To make the cookies: Beat together the butter, sugar, salt, baking powder, lemon, and vanilla till well combined. 3) Beat in the eggs one at a time, beating well after each addition. 4) Stir in the flour alternately with the milk, beginning and ending with the flour. 5) Using a muffin scoop or a 1/4-cup measure, drop the dough onto the prepared baking sheets. Flatten/spread the dough to a 3″-diameter circle. 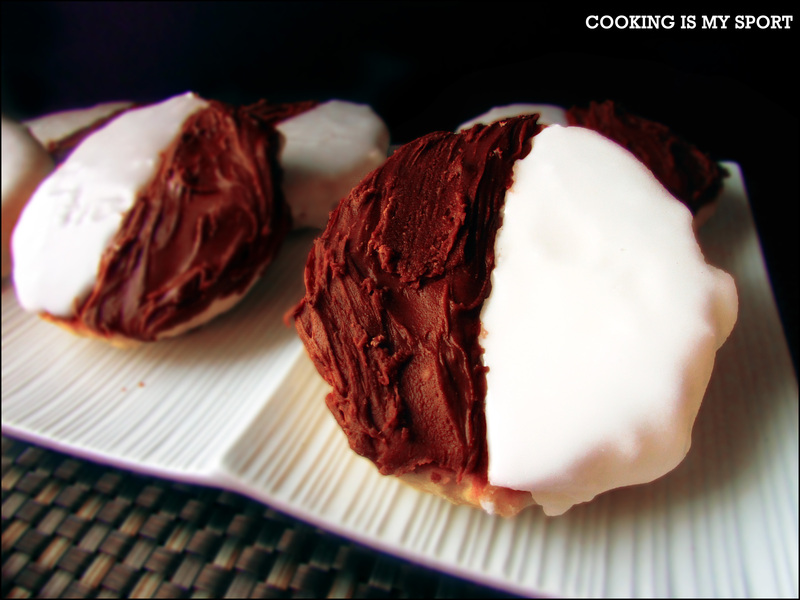 Leave 2″ to 2 1/2″ between each cookie. 6) Bake the cookies for 10 to 12 minutes, until they’re set, a very light golden brown around the edges. Cookies baked for 10 minutes will be quite moist. Cookies baked for 12 minutes will be drier. Bake for 11 minutes for an in-between cookie. 7) Remove the cookies from the oven, and cool them right on the pan. As they cool, prepare the icing. 8) To make the vanilla icing: Whisk together the confectioners’ sugar, corn syrup, and hot water. Spread the icing over half of each cookie. Place them on a rack to set while you make the chocolate icing. 10) To make the chocolate icing: Combine the confectioners’ sugar, corn syrup, vanilla, hot water, and espresso powder. stirring till smooth. In the microwave, or in a pan set over very low heat, melt the chocolate. Add the melted chocolate into the sugar mixture, stirring till well combined. Spread the icing on the uncovered half of each cookie. 14) Set the cookies back on the rack, and allow them to rest for about 30 minutes, till the icing is set. For best storage, wrap each cookie individually, in plastic wrap, and store at room temperature. They are classic! Sooooo good! Yes.they.ARRRRRE. I don’t where these cookies have been all my life, but they’re definitely here to stay! Thanks Prudy, they certainly make ME VERY happy.